Indoor coverage solutions will ensure that your wireless mobile connections are strong enough to handle regular phone calls without calls dropping. Or with the conversation becoming garbled are available for business people as well as for consumers. Most people are just totally frustrated when they find that they cannot make calls within their home or business. Often the carrier will not do anything about it since the business generated from that building or suburban area. They are just unwilling to spend the money since there is not enough return on their investment. They can change carriers. But this will usually involved changes in phones as well as cancellation fee’s especially if there is a contract in place. The mobile companies will not let you out of these contracts. Consumers also have the choice of doing nothing and just living with the situation as frustrating as it is. There is another solution to the Indoor coverage solution problem. Various vendors sell what are known as wireless repeaters for consumers as well as business situations. They vary a great deal in price as well. These systems must be tuned to the carrier that you are subscribed too. The wireless repeater must be tuned to the proper frequency for it to provide any improvement to your phone. If you decide to change carriers, this wireless repeater is not going to work for the new phone and improve this Indoor coverage solution problem. The other important message that you need to understand is that this repeater will improve Indoor coverage for all phones with the same carrier and the same frequency. Sometimes you will have guests, customers or other employees that use other phones from other carriers. 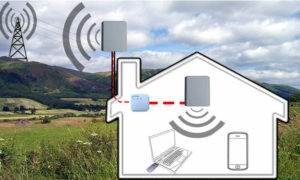 Your wireless repeater will not improve the indoor wireless coverage for their phones. However it is quite possible that one carriers signal could be more than strong enough to penetrate the walls of your home or business. This is imply because the transmitting tower is much closer for them that it is for your carrier. If all of this sounds complicated it can be. We have only discussed in general terms the theory of using repeaters. Most providers of wireless repeaters that solve indoor coverage solutions will be more than happy to help you through the decision process. They can help figure out which repeater makes sense for you and matches the technical requirements of your carrier. They will gladly do this for you with the expectation that you will make a purchase from them. We welcome comments from readers on this issue and look forward to your comments. For more details about indoor wireless coverage, click here. I think that the cell phone companies are getting better at this and I am not sure that buying your own repeater to improve indoor phone coverage.